A magical place inspired by the love of Anna & Abby; where people of all ages and abilities will experience the joy of play, the wonder of nature and the peace of community connection. Update 8/2018: When are they going to get started on Anna & Abby’s Yard? That is the #1 question I have gotten all summer long as Alice and I have played at Rogers Park. It is a very good question as our hope was that we were going to get started this summer. Then, something amazing happened which shifted the plan a bit. What happened? Our prayers were answered. A press release (included below) went out yesterday announcing the exciting news in regards to the completion of Anna & Abby’s Yard. We are so excited to announce that Harper’s Playground has joined our team and will help us raise the rest of the funds needed to make Anna & Abby’s Yard a reality. For the past 4 1/2 years, we’ve been praying for someone to help us raise the rest of the money needed to make Anna & Abby’s Yard a reality. Cody (Harper’s dad and CEO of Harper’s Playground) is an answer to those prayers. His guidance, experience, passion for inclusion and most importantly friendship mean the world to us and we are so grateful to join forces with him. Inspired by the love of my girls, Anna & Abby’s Yard will be a place where people of all ages and abilities will experience the joy of play, the wonder of nature and the peace of community connection. PORTLAND, Ore., July 25, 2018– Harper’s Playground today announced a $500,000 pledge of fundraising support for Anna & Abby’s Yard, a playground project in Forest Grove, Oregon being developed by Anna & Abby’s parents Susan Dieter-Robinson and Tom Robinson along with the City of Forest Grove, OR. As a result of the partnership, Harper’s Playground will offer inclusive design consultation to the team and help to raise $500,000 to fund the park design and construction, bringing Anna & Abby’s Yard even closer to a reality. “Harper’s Playground is honored to have been invited to join the team of Anna & Abby’s family, the City of Forest Grove, and the design team at MIG. We all share the same vision of a space that will honor Anna & Abby while serving everybody through radically inclusive design,” said G Cody QJ Goldberg, Harper’s Playground Executive Director. “The partnership with Harper’s Playground brings us one big step closer to Anna and Abby’s Yard becoming a reality and for that, we are extremely grateful for this partnership and look forward to working with them,” said Susan Dieter-Robinson, Anna & Abby’s mom. “The City of Forest Grove has a rich history of providing services in Parks and Recreation to our community, with inclusion being a foundational element at our facilities and programming for over 30 years. 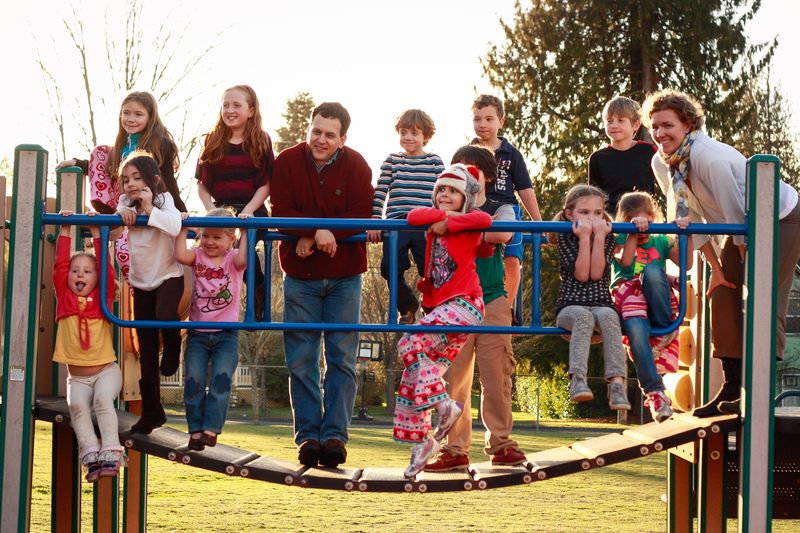 We are proud to be in partnership with Harper’s Playground on the Anna & Abby’s Yard project and look forward to a continued positive relationship”, said Tom Gamble, Director of Parks and Recreation, City of Forest Grove. A portion of the funds raised at the Harper’s Playground annual fundraising event, the Summer(ish) Soiree on September 16, 2018, will be allocated to the Anna & Abby’s Yard project, where Susan will be the keynote speaker. Construction on Anna & Abby’s Yard is scheduled to break ground in the summer of 2019. This is the fourth playground in the Portland metro area that Harper’s Playground has been a part of since the original Harper’s Playground opened in November of 2012. They have also consulted on projects in Salem, OR, Bainbridge Island, WA and inspired similar projects around the world. Harper’s Playground is a 501(c)3 nonprofit based in Portland, OR whose mission is to inspire vital communities by creating inviting playgrounds for people of all abilities. Their community-driven roots date to the founding by local parents on a mission to create a more equitable world for their daughters, one of whom uses wheels to get around. Together with their community, they designed, funded and built a brand new, first of its kind, fully-inclusive, nature-based playground at Arbor Lodge Park. Their next project in partnership with Portland Parks & Recreation, at Gateway Discovery Park, will celebrate its grand opening on Saturday, August 4. For more information, visit harpersplayground.org. Update 3/2017: I’m learning the process of building a playground is a very slow one. There is so much that goes into it and after 3 years of fundraising and dreaming, I am happy to say that it is looking like we are on the final stretch. With that said, I have no idea how long that stretch will take but I do see a light at the end of the tunnel. To date, there has been $140,000.00 donated to this project by so many kind and generous people from all over the country. The past three years I have received many bags of change (allowance money) from kids in our community and I am always so touched when I take those to the bank to deposit…this playground will truly be built by the kindness and generosity of this community and those that have been touched by Anna and Abby’s lives. Last week I sat down with the city of Forest Grove’s park department and with MIG (the landscaping design firm working on this project) to talk about the overall design and to brainstorm more ideas for Anna and Abby’s Yard and how it will fit into the larger scope of Rogers Park. I will say that I walked away with so much happiness in my heart and a vision of a truly magical place that will celebrate the lives of my daughters. The overall design of Anna and Abby’s Yard has changed since our original drawings/video but we are confident that the new plans that are in the works are something this community will love. We will be incorporating pieces of our old design from GameTime and weaving that with a more natural play space that will truly set Anna and Abby’s Yard apart from your typical playground. Our goal is to have a place where families can explore nature, play, experience life together and feel love and joy in one of Forest Grove’s beloved parks. Update 5/2015: The design for the playground is finally done. We are now working with the District Office and working out specifics with them. Fundraising is in full force with our first Annual Love Rocks Run happening on June 27th with the proceeds to this years run going to Anna and Abby’s Yard. Grants are being written and we will be doing a crowdfunding campaign mid-summer. We are excited and looking forward to the home stretch. Update 3/2015: It’s happening ~ slowly but surely! Update 12/2015: As we approach the end of the year we are so grateful to all of those who have given in some way or another to Anna & Abby’s Yard. In Nov. we met with Game Time and Forest Grove Recreation and are very excited about the new location of Anna and Abby’s Yard at Rogers Park. We also opened a GoFundMe page at https://www.gofundme.com/annaandabbysyard as a place to accept donations and spread awareness of what we are trying to do to honor our daughters. As of Jan. we will have a new little one in our family and we are very excited that Anna and Abby’s Yard will be a place that she will go to feel the love of not only our community but also feel the love and joy of her sisters. Update 10/2014: We started an Anna & Abby’s Yard Facebook page that will be updated with fundraisers, plans and eventually will let everyone know when we will be opening the park (smiling). Head here to get more frequent updates ~ Anna & Abby’s Yard Facebook Page. Update 7/2014: Plans are drawn for the new play structure and we are now beginning the next phase, raising funds. We are in the process of developing a Kickstarter campaign that will hopefully go live in the next month. We are working on an informational video, layout of rewards for the campaign and also working with a landscape architect on getting all of our ideas into a drawing. We are excited and can see our vision for this space slowly taking shape. There are smiles in Heaven I’m sure. Update 3/2014: We are working hard on the plans for the new playground/park behind the District Office. Here is a post that talks about our playground meetings with Anna and Abigail’s friends. If you are interested in volunteering with fundraising, pulling together of resources or building please send a message to alovedrenchedlife@gmail.com. If you are interested in making a donation please go to harpersplayground.org. I read your story tonight, while looking for answers after my very dear friend died. Your blog has reminded me of the answers: “fill your gaps with trust”, “acceptance of what you can’t change”. Thank you very much. Love and Peace to you and your family. I just want to say you are a very strong Mom, I have been following Love Rocks on FB. I know how hard it is to lose a child, but what I don’t understand is the loss of two beautiful babies. My heart goes out to you and your family. I lost my daughter Emma when she was 27 months, this February will mark the fifth year we have been without her sweet smile and cuddly little hugs. We will never quit understand why things happen and all we can do now is keep their sweet memories alive. I too am building a playground in memory of Emma. And Martha is also helping me. I would absolutely love to help you with any fundraising ideas you need. I just hosted my first of many fundraisers and we had a wonderful turnout and now are on our way to Emma’s Place Park. You are in my thoughts and prayers as you move forward. I am so sorry about your losses, I lost my baby girl at age 39. She was sleep walking on Jan 3, 2013 in the middle of the night and fell asleep by a tree and went to heaven before they (police) could find her. I have spent the last year in grief, only 75 yards down a hill from the door she left by dressed only in pj’s. The police didn’t even tell us she was missing until she was found. I need to channel my grief as you have into something with meaning as an honor to her. I love your idea of love rocks. God Bless you and your husband. I truly understand your pain. Hugs from Texas. I am truly sorry for your loss… Your precious girls story broke my heart… But I so Love this Love Rocks idea… What a Wonderful way to keep the Love alive. God Bless You and Your Family. I am very sorry to hear that! i hope who ever did it was caught. Thank you for sharing this story and inspiring me to use this as a way to remember my parents. In 2009 I lost my father to brain cancer and last month I lost my mother to colon cancer. Their love was like no other and anyone who came in contact with them felt it. They knew of no stranger and treated everyone like family. My parents saved for retirement and travels… A day that never came. In doing “LoVe RoCkS” I hope that their love continues and their rocks travel just as they would have done hand in hand. I heard your story first on Klove and they spoke of your faith and ability to forgive. I am now able to share the love rock idea with a dear friend of mines children. She died in a freak accident a few weeks ago. I pray that this will help them heal in some way! Praying for you and your family! I am so sorry for your loss. Thank you for your prayers. Hi there I’m so inspired by the wonderful things you are doing, but I don’t mean to be so forward but what happened to your beautiful little girls? Hi Sarah ~ my daughters were involved in a hit and run in front of my house last Fall. They went to Heaven on Oct. 20th. My prayers go out to you ., I am making love rocks today and love love this way you are spreading love , and making a positive message . Hi, I live in Rocky River and am a friend of your brother Bill. He sells me all my running shoes! I just want you to know that I have been praying for you, your girls and extended family. You sound like such a loving and strong woman with a great support system and I will continue to pray for you throughout the year. Hi Cindy! Thank you so much for praying for us…we feel them. Thank you also for connecting…it means a lot. I was talking to a friend who had the idea of a permanent bench right where the memorial is. I immediately envisioned Eric Cannon making one with faeries playing all over it. A place for everyone to sit and pray. I love that idea Bonnie. I’m working with an artist right now from Portland. I love the idea of a bench…maybe in the park under the big tree. The girls used to put a blanket down and bring the bunny out there. I really love that idea & Eric Cannon is just the person that would make that a beautiful echo of the girls. Great idea!